The latest House of Comments podcast is now out. Other podcasting software e.g. for Android can be pointed here to subscribe. Any feedback welcomed in the comments below. PS: A big thanks to Audioboom for hosting the podcast. We would also like to thank Kevin MacLeod from Incompetech.com for our theme music. During the AV referendum (I'm not bitter, honest) we heard time and again from No campaigners how much simpler First Past the Post is than the Alternative Vote. After all, all you need to do is put an X next to the person you want to win and then job done. That's so much easier than faffing about having to rank candidates, surely? Well it depends where you live and what you want to achieve with your vote. Under FPTP you only get one choice. It's a system with limited inputs and therefore there is a limit to how the system can process that input. There are plenty of examples of three way marginals in the current general election but let's take a live example. South Thanet. This is the seat that Nigel Farage hopes to win for UKIP. Indeed if he doesn't win it he has already said he will resign as leader so the stakes are pretty high for him. But an average of recent polls in the constituency put UKIP on 31.6%, the Tories on 30% and Labour on 29.8%. Let's put aside the fact that on these numbers, UKIP would win the seat on less than a third of the vote with nearly 70% of voters voting against the somewhat extreme Mr Farage (which is a definite defect of FPTP as well). What I want to focus on here is what a voter in South Thanet who wants to keep Nigel Farage out should do. So if you wanted do this you could vote Tory. After all they were slightly ahead of Labour in the polls. Well, 0.2% ahead, but given that there is a margin of error of 3% in the polls it's actually equally likely that the Tories are behind Labour and you'd be better off voting Labour to keep Farage out. This is an invidious position to be in for a voter. You are almost being forced to vote for someone you might not actually want to vote for. Let's say you're a natural Labour voter but you become convinced that the Tories actually have the better change of keeping UKIP out. In order to keep Farage out you'd have to vote blue. But that might be the wrong choice. Doing that might let Farage in! There's no way of knowing until the count. This is where AV would be a much better system. If our Labour inclined voter wanted to keep Farage out he could simply vote Labour 1, Conservative 2 (and either not rank UKIP at all or rank them at the bottom below all other candidates). Then when lower preferences are distributed at the count, if Labour are eliminated our voter's vote would go to the Conservatives who would then be in the final round with UKIP. But if it turned out Labour were in the final round, he/she had already voted for the other party in the final round to keep the purples out. This is a scenario where AV is actually a much simpler system than AV. The voter would not need to second guess how everyone else if going to vote in order to try and make sure their vote made the difference. They would simply rank their votes in such a way as they would definitely know it would count in the final round. Sadly we are not voting under AV or any sort of preferential system. The electorate rejected the change to the system so we are stuck with the current system for probably a long time to come. But when, eventually electoral reform creeps back onto the political agenda (as it may if we keep seeing hung parliament after hung parliament) just remember South Thanet in 2015 when someone tries to argue that FPTP is the simplest system. There are plenty of occasions when this is manifestly not the case. This week I am joined by Guardian journalist James Ball to discuss the seven way debate, the alleged Nicola Sturgeon memo and the Labour attack on the Lib Dems for being "soft on drugs"
This week I am joined by Lib Dem Voice editor Caron Lindsay as the "Short Campaign" begins to discuss the Cameron/Miliband interview with Paxman, the impact of Scotland on the upcoming election and how mental health problems are being portrayed in the media following the Germanwings tragedy. And they find time to speculate about Lib Dem prospects. A full week ago the campaigning organisation 38 Degrees published a post on their Facebook feed that included a graphic that claimed the NHS needs £8 billion per year by 2020 and listed the amounts pledged so far by each of the parties claiming Labour are the highest at £2.5 billion with the Tories and the Lib Dems on £2 billion each. The problem is that figure for the Lib Dems was wrong. The party had already pledged to spend the extra required £8 billion as this Guardian piece from January makes clear. Many, many, many people pointed out this error in the comments below the piece. And each time, painstakingly 38 Degrees responded individually to these comments conceding that they had made an error and acknowledging the Lib Dems had made the commitment they were asking for. At no point did 38 Degrees update the graphic in the original post. So the thousands of people who saw the post but didn't scroll down and read the comments, after 38 Degrees realised their mistake would still have been misled. Of course the best thing to do would have been to create a new Facebook post with a new graphic and to highlight the error they had made to make it clear what the real Lib Dem figure is.
.@38_degrees Thank you but it is not me that needs to see it. It's all your Facebook followers who were misled by the original chart.
.@38_degrees You need to do a new Facebook post with this new image highlighting the previous error so everyone is clear. That's only fair. @MarkReckons agree - we are doing this shortly. At the time of writing, a week on from the original mistake and two days after they promised me they would to do a new, correcting post, 38 Degrees have still not done this. They have clearly been active on the feed though doing posts about zero hours contracts and the NHS. They now appear to have deleted the original post (although the cynical amongst you might feel this is less to correct the error and more to clean the feed so such a blatant error is no longer visible) which is why I cannot link to it. The hypocrisy in this situation is quite evident. 38 Degrees was one of the organisations who most vociferously supported the Leveson Report and even launched a petition which currently has almost 30,000 signatures calling upon the government to implement Leveson in full. Of course one of the key recommendations of Leveson was for the new body to have powers to enforce the prominence of timely corrections when newspapers make errors to have an equivalent prominence to the original story. 38 Degrees have singularly failed to do that in this case where they have made a mistake. Of course a lie is half way around the world before the truth has a chance to get its pants on. In this case many of the thousands of people who saw the original Facebook post and chart (before it became an unpost) will still likely believe it. It appears that 38 Degrees think that equal prominence should only be given to corrections by other people. At least that is now clear. Ever since the formation of the coalition, Lib Dem voters have been abandoning the party and in a lot of cases going to Labour. I have always found this a little surprising given all the things that Labour did while in power but if a week is a long time in politics then 5 years is a lifetime and memories of course fade. But if you are trying to woo voters who at the most recent general election voted for a liberal party, why on earth, 5 weeks out from polling day would you release this leaflet? "And they would end prison sentences for drug posession - even for the hardest drugs like heroin and crack". Now to me this just seems like a cynical attempt at vote grabbing. I suspect even those who drafted this leaflet know the current legal regime around drugs is self-defeating and damages the most vulnerable in society. But I think campaigning in this way is actually very misguided if you think about it. Labour's best shot at being the largest party in parliament is by holding onto (and getting more of) those people who voted Lib Dem last time. 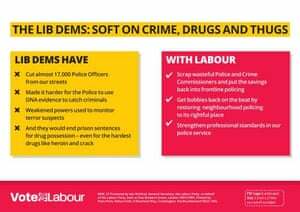 Whatever else the Lib Dems have done, as a party their drugs policy is very clear. Indeed it is one of the most distinct "clear yellow water" issues between the Lib Dems and the two main parties. And many Lib Dems really, really like that policy. I know from personal experience having been one for several years. In all my discussions when I was a member on this subject (and that is a lot) I can count on one hand the number of Lib Dems I met who thought the current laws on drugs are right to stick with. This even applied to the older generations of Lib Dems in my experience. So if anything, campaigning like this is likely to push wavering former Lib Dem voters back towards the yellows. Or at the very least make them hesitate when deciding whether to put their cross next to Labour. And let's not forget there are other options out there for voters too. The Greens also have a very progressive drugs policy and I am sure this will have pushed some who were going to vote Labour towards them too. Labour should probably be grateful that this leaflet and the reaction to it in the media has largely been confined to online comment and articles in The Independent and The Guardian. Because the wider coverage this gets, the more likely I think it is to actually cost Labour votes. They have fallen back on what they think is a "safe" issue to campaign on when in actual fact it is anything but for them given the current political situation.